New, large, modern 4 5-room apartment NR (145m2). Bright, spacious living / dining area with fireplace and open kitchen. Large south-facing balcony with unobstructed views of the Matterhorn and the village. The apartment has 3 bedrooms (2 double bedroom, 1 bedroom with 2 single beds), a spacious bathroom and a separate day toilet with shower. Enjoy unforgettable days in one of our 3 stylish and characterful apartments in the midst of the Zermatt four-thousanders. All apartments are spacious, modern, cozy and nicely furnished with an open living, dining and kitchen area (some with fireplace). From the south balcony you have a unique, unobstructed view of the Matterhorn and the village. In a few minutes you are in the village center with its countless shops and the worth seeing old village center. Also within easy walking distance are the Gornergratbahn as well as the valley station of the Sunneggabahn and the bus stop, which are both accessed by a new lift, which is located just above our house. In winter you can drive from the ski resort Sunnegga-Rothorn almost to the front door and in the summer his hikes start directly from the house. A few steps from the house is the 'Horu cheese factory'. The young, innovative dairy couple offers cheeses made from local milk all year round and fresh yoghurt in winter. This apartment is immaculate and extremely comfortable. It is a ten-minute walk from the train station. The last 200 meters of this walk is quite steep. The apartment is in a very quiet part of town. It is close to the bottom station of the Sunnegga tram. My family stayed in the Stellisee apartment from 20 Dec.-27 Dec. 2014. It could not have been better. Fransiska and Oliver were so easy to communicate with and the booking process was also very easy. Oliver met us and helped with the luggage and gave us a tour of the apartment. 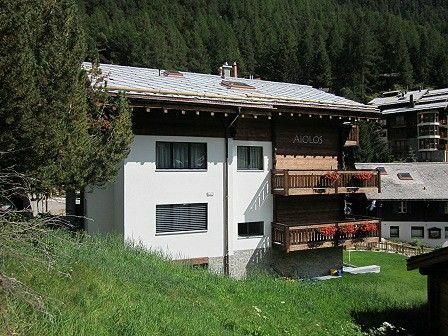 It is exactly as shown in the pictures- clean and spacious with a killer view of the Matterhorn and village. The location is excellent- 5 minutes to the Gornergrat train and the village. It also wasn't too far up the hill so walking was very easy. We loved the extra touches- getting fresh bread and croissants every morning, a Christmas card and chocolates upon arrival, Christmas cookies, and chocolates upon leaving. We can't wait to go back and enjoy Haus Aiolos again. We stayed in the Riffelsee apartment for the week of Christmas. Everything in the apartment was new, clean, and just like the pictures. The beds were extremely comfortable.The view from the balcony was breathtaking. The owners were very prompt with emails and very helpful. When my son became ill, they arranged a taxi to take us to a doctor they recommended. The walk to and from town was not too far, although the apartment is up a steep hill.We would definitely recommend this apartment. At the end of the 30 km long Nikolai valley, on the Italian border of the western Swiss canton of Valais, lies Zermatt, the village at the foot of the Matterhorn, the most photographed mountain in the world. For our guests from abroad Zermatt represents Switzerland: high-alpine, sublime and original. Almost a third of the 4000 Alpine grouped around the village, which is visited for the first ascent of the Matterhorn in 1865 by climbers from around the world. Hotel and catering are of world renown. The ski area is not only the highest in the Alps. It is known worldwide as one of the best developed and makes bold sporting experiences on the steepest slopes in the world - 365 days a year. The climate is of an excellent quality: with 300 sunny days per year so little precipitation falls than anywhere else in Switzerland. Zermatt air is clear, dry and clean, because in the village, only electric cars without a combustion engine - and since 1947th In Zermatt some things are different. Zermatt - a world apart.